NYC Dept. of Homeless Services, is pleased to announce a concert to benefit Families & Children via the Homeless Trust Fund. 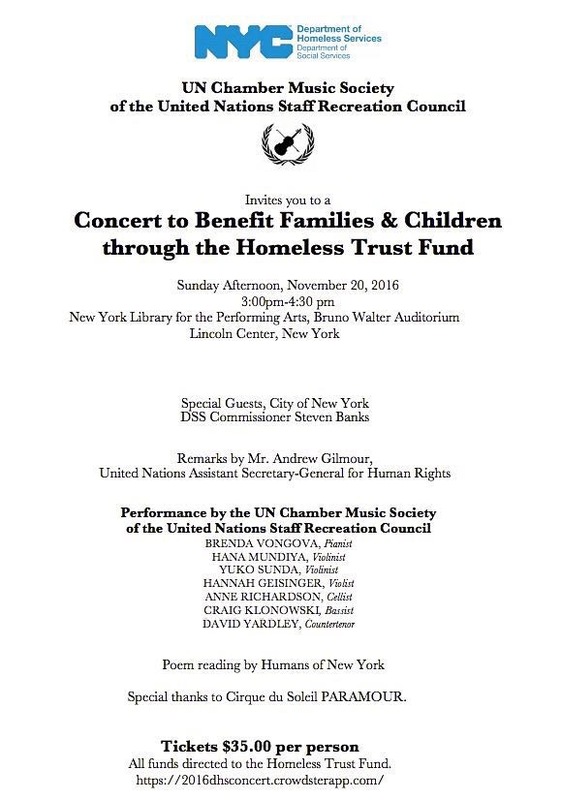 The concert will feature The UN Chamber Music Society and be held at Lincoln Center – New York Library for the Performing Arts, Bruno Walter Auditorium, Lincoln Center, NY, November 20th from 3:00-4:30PM. Special Guests will include City of New York DSS Commissioner, Steven Banks, and special remarks by Mr. Andrew Gilmour, United Nations Assistant Secretary-General for Human Rights.